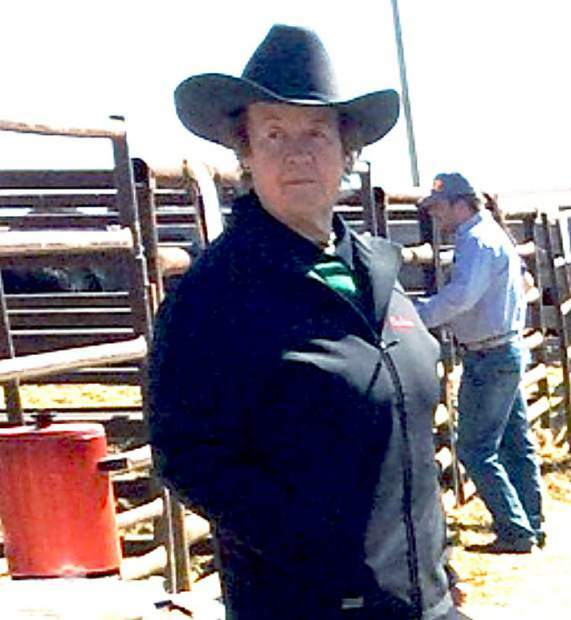 Sale host Charlene Mehling looking over the bulls at the annual Medicine Rocks Angus bull sale. Medicine Rocks Angus, Frank and Charlene Mehling from Baker, Mont., held their annual production sale at the Bowman Auction Market, Bowman, N.D. The Mehlings adhere to a very strict culling regimen for their cow herd, stressing structural soundness, udder quality, fleshing ability, productivity and disposition. Their culling program insures a cow herd that is deep ribbed, long bodied and moderate framed. The bulls in the sale were a direct reflection of their program. Deep, long and naturally thick. The bulls had an avg. 205 day wt of right at 700 lb. without ever seeing any creep feed. They had been developed at Midland Bull Test and were in excellent sale condition, but not overdone. Topping the sale was lot 47: MED ROCK HOOVER 306, a March 15, 2013, son of Hoover Dam. This calving ease herd bull prospect posted a weaning ratio of 110 with EPDs of BW 0.1 WW 51 Milk 26 YW 76 and sold for $8,000 to Tom Teske, Scranton, N.D. The next top bull was lot 16: MED ROCK CONTRAST 9724 372, a March 15, 2013, son of Med Rock Contrast 702 09. This bull had a weaning ratio of 112 with EPDs of BW 2.2 WW 63 Milk 24 YW 102 and sold to Jim Bird, Volberg, Mont., for $7,750. Alvin Cordell, Camp Crook, S.D., selected lot 21, Med Rock LO Sprint 320 at $7,000. This April 1, 2013, son of Bovagene Sprint of LRC has EPDs of BW -0.5 WW 51 Milk 20 YW 92.